Angela Merkel managed to secure a fourth term in the 2017 German federal election, but she has faced increasing domestic pressure over recent months. John Ryan writes that the fourth term did not end well for previous German Chancellors Konrad Adenauer and Helmut Kohl, and history appears to be repeating itself for Merkel. German Chancellor Angela Merkel’s fourth election has turned into a heavily qualified victory. She is facing criticism over how she has handled the refugee crisis and some say that she should not have let in over one million refugees into the country. That sentiment is more widely felt in Germany than the public debate that dominated the political campaign and media coverage generally reflected, and it showed not only in the rise of the Alternative für Deutschland (AfD) party, but also in the flight of voters from Merkel’s Bavarian sister party, the Christian Social Union (CSU). The CSU was and is particularly unhappy with Merkel’s controversial decision to let in over a million immigrants – many of them entered Germany via Bavaria. The CSU was punished at the polls for their close association with Merkel’s open door policy, losing ground to the AfD. An unprecedented seven parties entered the Bundestag after the September 2017 election. Alongside Merkel’s conservative Christian Democratic Union (CDU), her Bavarian allies the CSU, and the Social Democratic Party (SPD), the four smaller parties were the leftist Die Linke, the liberal Free Democrats (FDP), the Greens and the right wing AfD. Before the election, the CDU/CSU and the SPD held 80% of the seats in the Bundestag, with the Greens and Die Linke holding the rest. What this means is that the executive was strong and the legislature was weak. The 2017 election changed the German political landscape. Chancellor Merkel has always been more of a manager than a visionary. But her often opportunistic brand of politics has become less and less popular. Her party had its worst showing since 1949 in the last election, as voters called time on centrism. Merkel’s fourth term was – at the very least – set up to be a bumpy ride and at worst short-lived. The CDU had already made big concessions to the SPD which retained control of the Foreign Affairs and Labour Ministries. In the renewed coalition arrangement, it also took charge of the crucial Finance Ministry. After the election, the other big winner was the AfD. With the CDU and the SPD back in government, the AfD became the third largest party in the Bundestag and Germany’s official opposition. Merkel knows that her fourth chancellorship will probably be the last. Even before the federal election, it had taken her a long time to decide on running for a fourth term. And it is not only the opposition that is pushing for change: some in the CDU are counting on Merkel leaving – better sooner than later. The right wing of the CDU cannot forgive Merkel for moving the once conservative CDU so far in a liberal-social democratic direction. Conservatives have been grumbling for a long time, and are thinking about an end to the Merkel era. Merkel’s CDU has lost more influence in the new government than it has gained. Germany’s grand coalition – the third in Merkel’s long chancellorship – was supposed to be a good outcome for Germany’s short-term stability, especially with regard to Europe. But recent events such as another populist governing coalition in Italy and the threat of a trade war with the United States, show that there is growing uncertainty all around and on the back of that the grand coalition looks ill equipped to survive. Looking back in German political history, the fourth term did not end well for Chancellors Konrad Adenauer and Helmut Kohl. It seems to be a similar story for Angela Merkel. The CSU is frustrated with Merkel’s course on migration and feeling the pressure from the right wing, namely the AfD. Even outside of Bavaria, many Germans don’t trust Merkel to fix the refugee system. A recent poll showed 53 percent say Merkel hasn’t managed the refugee influx well. Meanwhile, a poll in Stern magazine showed that about two-thirds of Germans agree with the CSU’s position on turning away refugees at the border. CSU Minister of Interior Horst Seehofer stepped back from his initial demand to immediately introduce new border controls, and ‘granted’ Merkel until after the EU summit on 28-29 June to find a European solution to the topic. The Eurozone reform process is not moving forward and now migration discussions at the summit will be tense. Coming up at the rear of the summit agenda is the unresolved Brexit process. 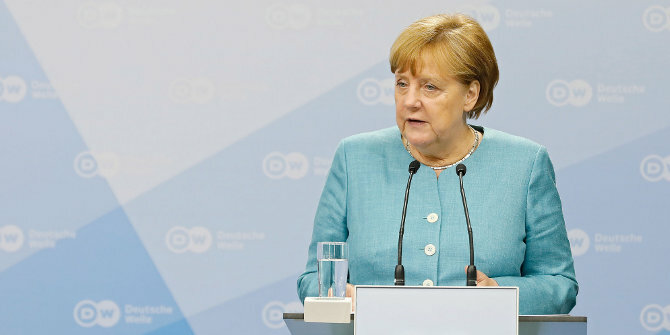 For Merkel, things at the domestic level are very difficult and getting substantive results at the European level looks unlikely This is not only putting a question mark over her current position, but will also increasingly raise questions about her political legacy. Professor John Ryan is a Visiting Fellow at LSE IDEAS. He was a fellow at St Edmund’s College, University of Cambridge, and the German Institute for International and Security Affairs, Berlin. To hell with her. She’s done enough damage to last for decades to come. Unless the immigrants who entered Germany following Merkle’s open door invitation have been assessed as genuine refugees fleeing war. persecution etc. they are illegal immigrants and not refugees. It will be great day for the whole of Europe when she is kicked out of power. The correct term would be asylum seekers and that’s exactly what Germany has been doing – assessing the applications (something like 40% have been approved).